All the flavors of fall are combined into one warm bowl of pumpkin spice oatmeal in this quick and easy pressure cooker recipe. Pumpkin puree, pumpkin pie spice, cinnamon, butter, and oats are cooked together creating a flavorful breakfast in less than 30 minutes. Steel-cut oats usually take over 30 minutes to cook, but thanks to the pressure cooker your total cook time is only 15 minutes! Set pressure cooker to Sauté on High. Melt butter in the inner pot of the pressure cooker until slightly browned, about 1 minute; stir in oats, pumpkin pie spice, and cinnamon until fragrant and butter is absorbed into the oats, about 30 seconds. Press Cancel. Stir water, pumpkin puree, and salt into oat mixture. It's fine if the pumpkin doesn't totally incorporate, it'll cook into the oats while pressure cooking. Lock lid in place, turn steam vent handle to Sealing, and select Porridge. Cook on High Pressure for 12 minutes for oats with a bit of bite or 14 minutes for softer oats. Turn steam vent handle to Venting to quick-release pressure. Remove lid and stir oatmeal. Stir brown sugar into oatmeal and add any additional toppings. Stir raisins and small chunks of apple in to your pumpkin spice oatmeal for extra fiber and flavor. If you are looking for a gluten-free version, check your grocery for gluten-free oats. For a creamier version, substitute almond milk or whole milk for the water. Per Serving: 407 calories; 11g fat; 67.6g carbohydrates; 11g protein; 15mg cholesterol; 118mg sodium. Most amazing oatmeal in a long time. Delicious flavor and so fitting to the season. Highly recommended. 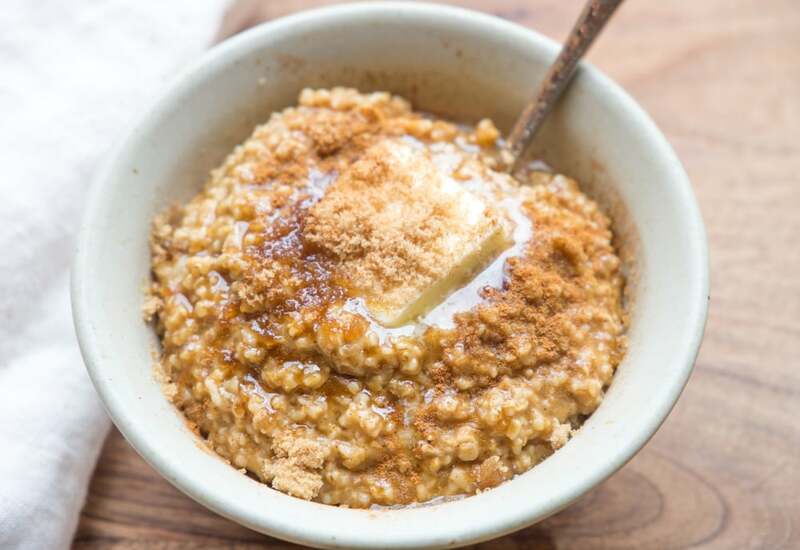 Our favorite oatmeal recipe so far and we have tried a ton! I added a 1 tsp. cinnamon, 1/2 c. Almond milk, 1/4 c. Pumpkin puree & 1/2 c. Walnuts. After cooled I put in single serving size Pyrex dishes & froze. Excellent when reheated & top with a bit more almond milk! Tried this twice. First time I set for 14minutes and second time for 13 minutes. Both times some of the oatmeal was caked on to the bottom of the pot. Should I add another Half cup of water? This was my first recipe using my new Instant Pot. Twice the “burn” indicator came on and I had to stop cooking and try to ascertain what was going on. Does anyone know why that happens? Oatmeal still came out DELICIOUS, however! So yummy! I prefer more pumpkin flavor than the recipe listed. I will add at least 1/4 cup of pumpkin the next time. This is so delicious! I added more pumpkin about a 1/3 cup and increased the cinnamon 1/2 t. I toasted the oats using Bhee (a clarified butter). It has a higher burn point. Cooked for 14 minutes. It did stick, but I stirred and gently scraped the oats, the toasted bottom, was the best part. Oh so good!!! Made this for breakfast on a cold morning. It was perfect. I added a just a little more water and made sure to give it a good stir before closing the lid. (I don’t like my oatmeal to be too dry so I always add a little extra water.) This cooked perfectly and we really enjoyed it! Will make this again!